Shaping is the basic method generally used to teach patients how to swallow pills. It is a behavior modification term. Through "shaping", you teach a patient how to do a difficult task by breaking the task down into the simplest task and then increasing the difficulty as the patient has success. When teaching a patient how to swallow pills, one generally starts with very small candy ‘pills’ and then moves to progressively larger ones as the patient masters the technique. With children, in particular, the best non-medication substances to use for practice are cake decorations and candies. Purchase a series of increasingly larger sized cake decorations (such as tiny round candy balls called “mixed decors” and sprinkles) and candies (such as mini-M&M's, Nerds, or Tic-Tacs). [Click here to view the Candy Chart for Shaping.] Although some suggest you only use the white decorations since they most look like medication, medication comes in many colors and it is equally reasonable to use colored candies and cake decorations. 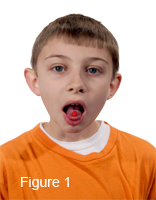 Demonstrate pill swallowing before your patient tries. You can do this with one or more of the suggested fake "pills" mentioned below. If you find it difficult to swallow pills, ask someone else to teach your patient. When your patient is ready to start practicing pill swallowing, start by having him swallow just water. Next, select the smallest cake decoration, such as the mixed decors (balls). 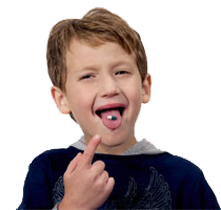 Place the smallest “pill” on the tongue. Placement may need to be modified based on size, form, and degree of gag reflex. Most should be placed in the middle of the tongue as shown. [See Figure 1] Have him take a big sip of water from a cup. Tell him to keep his head level or, alternately, to tip the head back. He should then swallow the water and the “pill” together. Finally, he should have another sip of water to keep the “pill” moving. If the “pill” does not go down with the first swallow, encourage your patient to keep drinking. More than likely, it will probably wash down with the next gulp of water. If your patient succeeds, then have her repeat the process several times with the same size "pill" to reinforce the skill and boost confidence. Allow as many trials as needed for success as long as the patient’s frustration has not become excessive and praise for all attempts. If he/she struggles through each try with this smallest "pill", then go back to just swallowing water, praise him/her for this, and calmly suggest that you will try again another time. When your patient has mastered swallowing the first size for a few trials, move on to the next size. Gradually increase the size of the candy—oblong sprinkles used for cake decoration; round, silver cake decoration; round, candy--approx. 1/8- to - inch in diameter; capsule-shaped candy, such as Tic-Tacs, and Mini-M&M’s. Again, with each new success, have her practice several times before proceeding to the next size "pill". If your patient is unsuccessful twice with the next size, have him go back to the previous size before ending the lesson. This guarantees that your patient will always finish a practice session with a success. Sessions should last no more than 10-15 minutes, and possibly shorter -- depending on your patient's tolerance level. Subsequent sessions should start with the last size with which your patient was successful before progressing to the next size. Your patient may be able to progress through all the sizes in one session; however, it may take anywhere up to 5 or 6 more sessions before the skill is mastered. 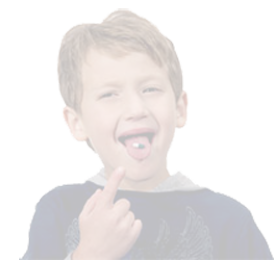 When your patient can reliably swallow the Tic-Tacs or mini-M&Ms, you can ask him to try swallowing an actual pill such as an appropriate vitamin for the patient's age group. By the way, for children, experts advise not to refer to these fake ‘pills’ as candy during practice, since swallowing real candy rarely triggers anxiety and the child may not transfer the skill to real medication if he believes he is practicing on candy. In addition, most people typically chew candy and medicine should usually NOT be chewed. In the sidebar on the right is a poster, "Is It Candy or Medicine? ", that you can share with your patient that shows the similarities between medications and many well-known brands of candy. It is important to emphasize to the young patient that although the medicine may look like candy, they are very different. Remember, your patient requires the opportunity to practice in order to maintain this new skill. 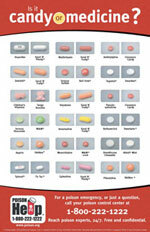 Some patients will enjoy tracking their progress through the different sized pills. Click here for a sample chart that your patient may find helpful. We have provided age appropriate charts.